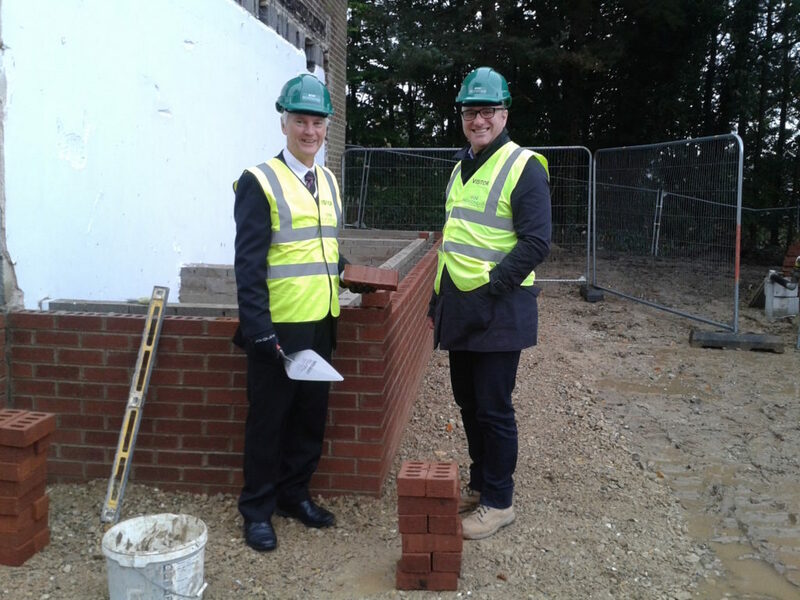 Acclaim Housing Group Chief Executive Gerald Taylor has joined construction partner Woodhead Living to lay the first bricks on an Ashbourne scheme of brand new homes, as work to renovate existing nearby flats gains momentum. The site at The Firs in Ashbourne is part of a wider scheme set up by Acclaim Housing Group, the parent company of Dales Housing, to refurbish existing housing stock and build brand new homes. The £1.3million project being carried out by Woodhead Living for Dales Housing is split into two parts. The first sees the refurbishment of 16 flats, which were previously part of an independent living scheme, to offer a mix of social housing and private rental apartments. Alongside this, the creation of four two-bedroom homes and one three-bedroom property for private sale will sit alongside The Firs and form part of the existing community. The project, which has already seen the demolition of part of the existing building to allow for a new car park area, is well underway with the refurbishment and reconfiguration of the existing flats now ploughing ahead. The refurbishment and new build properties are due to be completed in spring 2016.